Anthropometric indicators play an important role in the health status assessment of individuals and populations across the different vulnerable groups, due to which it is necessary to ascertain the percentile distribution of the weight, body mass index (BMI), and mid-arm, thigh, and calf circumferences in pregnant women for each week of gestational age. This descriptive and cross-sectional study included 4,481 measurements of anthropometric variables obtained from 745 pregnancies out of 719 subjects aged between 19 and 39 years, who were well-nourished, healthy, without clinical edema in the third trimester, with single pregnancy, and validated gestational age. All evaluations were conducted at the Centro de Atención Nutricional Infantil Antímano, CANIA, from 1998 to 2012. The anthropometric measurements were performed by standardized anthropometrists. Measures of central tendency and dispersion, bivariate correlations, and percentiles 3, 10, 25, 50, 75, 90, and 97 were calculated for each gestational age, between the 8th and 37th weeks of gestation. The number of measurements performed for each studied variable ranged from a minimum of 101 and a maximum of 241 at each gestational week. 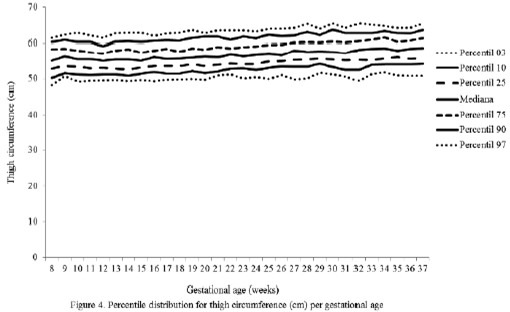 The BMI and circumference behaviors showed increases as the gestational age advanced. The changes in the variables observed in the 50th percentile between weeks 8 thru 37 were: weight, 10.10 kg; BMI, 4.23 kg/m2; and circumferences (cm): mid-arm, 0.45; calf, 1.60; and thigh, 3.55. The results of this study provide the means to simplify the screening and follow-up of the nutritional status in an accurate manner at any stage of gestation until the 37th week. Key words: Percentile distribution, Pregnancy, Anthropometry, Assessment of nutritional status. Los indicadores antropométricos juegan un papel importante en la evaluación el estado de salud a nivel individual y poblacional en los diferentes grupos vulnerables por lo que resulta necesario conocer la distribución percentilar del peso, índice de masa corporal (IMC) y circunferencias: media del brazo, muslo y pierna, para cada edad gestacional. Estudio descriptivo, de corte transversal, incluyó 4484 mediciones de las variables antropométricas obtenidas de 745 embarazos, provenientes de 719 mujeres, con edades comprendidas entre 19 y 39 años, sanas, eutróficas, sin edema, con embarazo simple y edad gestacional validada, evaluadas en el Centro de Atención Nutricional Infantil Antímano, desde 1998 hasta el 2012. Las mediciones antropométricas fueron realizadas por antropometristas estandarizadas. Se calcularon medidas de tendencia central y de dispersión, así como correlaciones bivariantes y percentiles 3, 10, 25, 50, 75, 90 y 97 para cada edad gestacional, entre las 8 y 37 semanas de gestación. El número de mediciones realizadas para cada variable analizada varió entre 101 y 241 por edad gestacional. El comportamiento del IMC y circunferencias evidenció incrementos a medida que aumenta la edad gestacional. Los cambios referidos al percentil 50 de las variables, de las semanas de gestación 8 a la 37 fueron: peso 10,10 kg; IMC 4,23 Kg/m2; circunferencias (cm): media del brazo 0,45; pierna 1,60; muslo 3,55. Los resultados de este estudio constituyen una herramienta que simplifica la evaluacion inicial y el seguimiento del estado nutricional de manera puntual en cualquier momento de la gestacion hasta las 37 semanas de edad gestacional. Palabras clave: Distribución percentilar, Embarazo, Antropometría, Evaluación nutricional. An adequate nutritional status in women of childbearing age resulting from a healthy lifestyle favors maternal health and reduces the risk of fetal morbidity, alterations in fetal development and growth, and the likelihood that their infants will suffer from chronic non-communicable diseases in adulthood (1). The assessment of a pregnant woman´s nutritional status should be carried out in an integral manner, including dietetic, medical, biochemical, and anthropometric indicators. These indicators lack gestational age-specific percentile distributions, which are essential for their correct interpretation. In the last few years, it has been demonstrated that anthropometric indicators are useful in the assessment of health status at an individual and population level along the different life stages (2). The anthropometric assessment of a pregnant woman is performed for two purposes: 1) To determine the nutritional status during early pregnancy in order to ascertain the conditions in which she will face physiological and nutritional requirements during pregnancy and follow the respective dietary recommendations at the beginning of such period, as well as the necessary adjustments in accordance with its evolution (3), and 2) To estimate the likelihood of low weight at birth, intrauterine growth restriction (IUGR), and small newborn for gestational age (SGA) (3,4). Furthermore, the American College of Obstetricians and Gynecologists (ACOG) together with the American Dietetic Association (ADA) have established socioeconomic, dietetic, medical, biochemical, and anthropometric factors, which allow to catalog a pregnant woman to be at “nutritional risk” when these are present during pregnancy. Among the anthropometric factors is the weight increase beyond the established ranges, according to the pregnant woman´s nutritional status and trimester of gestation. On the other hand, the adequate weight gain of the mother during pregnancy is associated with a lower risk of complications during pregnancy and partum. In addition, it favors the health and weight of the newborn baby (1,5,6). In general, the body mass index (BMI) is frequently used for classifying the nutritional status during early pregnancy and monitoring the nutritional status throughout pregnancy (7). In search for a method to properly monitor the anthropometric nutritional status of a pregnant woman, Chilean researchers generated cutoff points for this indicator for gestational age (8). As for the mid-arm circumference (MAC), this variable is considered to be independent from the gestational age due to the fact that it shows very few changes throughout pregnancy (7). Measurements of thigh (TC) and calf (CC) circumferences (cm) are performed as part of the anthropometric evaluation of a pregnant woman, as suggested by the World Health Organization (3). Despite the importance and widespread use of these diagnostic tools, there are no publications available on reference values in pregnant women per each week of gestational age, which would allow for a specific, adequate, and timely nutritional diagnosis or the follow up of the nutritional condition in these women at different stages of care. In spite of the above, percentile distribution values of anthropometric variables are not available for the categorization of nutritional status; therefore, we propose conducting a research with the following objective: To determine the percentile distribution of weight, BMI, and body circumferences (MAC, TC, and CC) in adult pregnant women for each week of gestational age. This descriptive and cross-sectional study included 4,484 measurements of the analyzed anthropometric variables, obtained from 745 pregnancies out of 719 subjects aged between 19 and 39 years, and evaluated at the “Nutritional Care for Pregnant Women” unit of the Centro de Atención Nutricional Infantil Antímano (CANIA), between October 1998 and July 2012. The inclusion criteria were: well-nourished and healthy pregnant women, maintained during the investigation, with single pregnancy, and gestational age at admission to the study of 13 weeks, according to the last menstrual period (LMP). The gestational age was calculated using the Battaglia clinical method, and was validated by obstetrical ultrasound, where the difference between both gestational age estimation methods could not exceed 2 weeks. The nutritional classification of the subjects was made by applying the integral nutritional diagnosis based on clinical, anthropometric, dietetic, and biochemical indicators, in accordance with a previously established methodology (9). With regard to the anthropometric indicators used in the nutritional classification, it should be noted that, for the interpretation of the BMI, Frisancho´s classification criteria (10) were used in the first trimester due to the fact that they showed the best results for sensitivity and specificity in the diagnosis of the nutritional status in malnourished pregnant women by deficit and excess in previous studies of the same population (11). In the following trimesters, Atalah´s reference values were used as these were the only ones available for the follow-up of this indicator (8). On average, 6 anthropometric measurements were performed for each subject, with values of minimum 1 and maximum 15. The number of measurements performed for each studied variable ranged from a minimum of 101 to a maximum of 241 for each week of gestation, meeting the quality criterion set by Jelliffe & Jelliffe in preparing reference values for these studies, which is a minimum of 100 measurements (12). These measurements were performed during the first screening visit and subsequently every 15 days until pregnancy week 39; however, the percentile distribution for each variable was performed starting on pregnancy week 8 until pregnancy week 37 as the minimum required number of measurements was not available for the first two months, and the last two weeks of pregnancy. The missing measurements for those periods do not affect the applicability of the percentile distribution for body composition anthropometric indicators in daily clinical practice. The studied variables were weight, BMI, MAC, TC, and CC. The measurements were performed by anthropometric measurement technicians, previously trained and standardized every three months, as recommended by the International Biological Program (13). The mean intraobserver and interobserver measurement error for each variable is shown in table 1. A Nasco® measuring tape (precision: 0.1 cm) was used to measure the circumferences; a Health o Meter® (precision: 100 g) dial scale was used to measure the weight; and the stature was measured using a Harpenden stadiometer by Holtain Limited® (precision: 0.1 cm). The last two measurements are required to calculate BMI, which was done using the following equation: BMI (kg/m2) = Weight (kg)/Stature2 (m2). The following descriptive statistics were obtained for the statistical analysis: mean, standard deviation, median, moden, asymmetry, standard asymmetric errors, kurtosis, standard kurtosis errors, and the maximum and minimum values of the studied variables. The Kolmogorov-Smirnov test was used to obtain the distribution for each variable, and the coefficient of variation was calculated to determine variable dispersion. These were applied to all the studied variables. Both tests were applied in all of the studied variables. The t-test and the Mann-Whitney test were used to study the significance of differences between means and distributions, respectively, for the analyzed variables. The established level of significance was p<0.05. 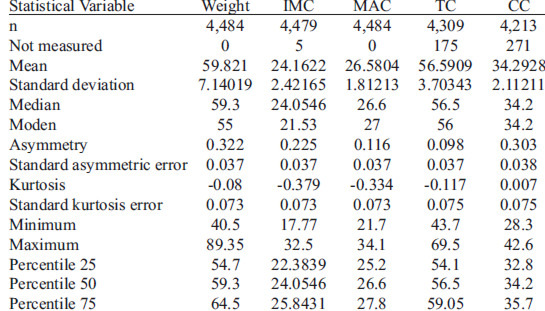 In order to establish a linear relationship between the studied anthropometric variables, bivariate correlations were calculated using the following values for their interpretation: weak correlation (≤ 0.49), medium correlation (0.50 – 0.74), strong correlation (0.75 – 0.89), and very strong correlation (≥ 0.9) (14). Likewise, for each studied variable, percentiles 3, 10, 25, 50, 75, 90, and 97 were calculated for each gestational age week between weeks 8 and 37. Data processing was carried out using the SPSS program (Version 9.0) (15). The distribution of the pregnant women by age shows a higher concentration of women aged between 19 and 23 years, which represent 49.5% of the study group, matching the demographic characteristics of the population attending consultation (CANIA 2013). The descriptive statistics for all of the analyzed variables: weight, BMI, MAC, TC, and CC are shown in Table 2. The Kolmogorov-Smirnov test evidences a normal distribution of the data. The coefficient of variation for each studied variable showed lower dispersion proportions for the circumferences, ranging from 6.18% to 6.81%, and higher dispersion proportions for the weight (12.04%) and BMI (10.07%). P-values during the pregnancy weeks in which variations in the variables were statistically significant were between weeks 12-13 and 18-19 for weight, between weeks 21-22 and 26-27 for BMI, and between weeks 12-13 and 18-19 for calf circumference. The correlation analysis showed a strong correlation between weight and BMI and circumferences (thigh and calf); a medium correlation between weight and MAC and between BMI and the circumferences (MAC, TC, and CC); and also a medium correlation between the three studied body circumferences. The percentile distribution of the studied variables is shown in Figures 2 to 6. 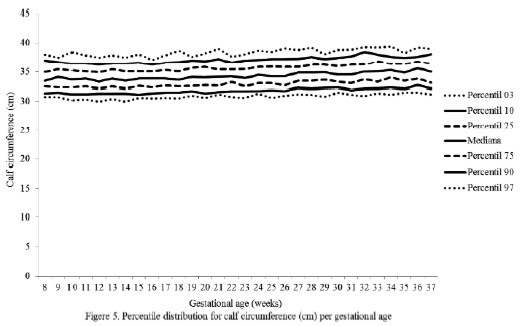 It is important to point out that smoothing was not applied to the data presented per gestational age. The weight varied, showing slight climbs and drops between gestational weeks 7 and 14, followed by a discreetly gradual increase until week 36 (Figure 1). 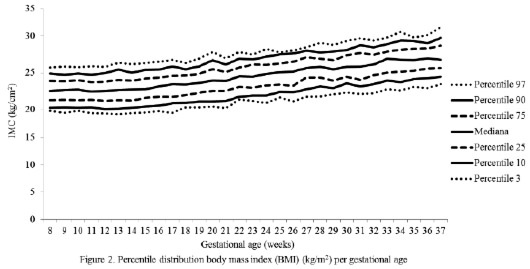 BMI indicator showed small increases across all gestational weeks (Figure 2). 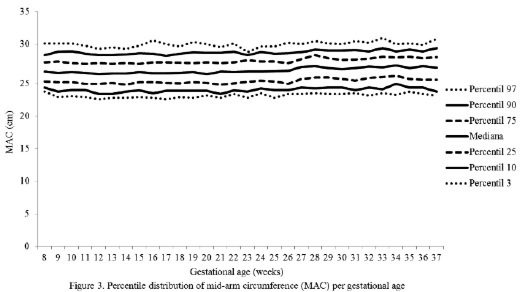 MAC values remained unchanged from gestational weeks 7 to 37 (Figure 3). TC values showed small fluctuations from one gestational week to another in all of the analyzed percentiles with a discreetly ascending tendency, and becoming more pronounced from week 17 to week 27 (Figure 4). CC values showed small increments and decrements until gestational week 18, followed by a progressive increase until the end of the pregnancy period (Figure 5). 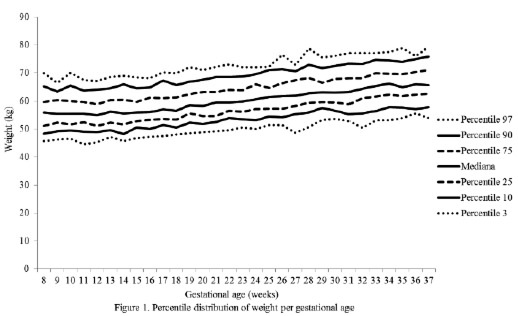 The changes in the variables between gestational weeks 8 and 37 observed in the 50th percentile were: weight 10.10 kg; BMI 4.23 kg/m2; and MAC 0.45 cm, TC 3.55 cm, and CC 1.60 cm. The small increments and decrements in weight values until the 14th week of gestation are explained by the impact that the frequent symptomatology during the initial stages of pregnancy may have on this variable, such as nausea, vomiting, loss of appetite, and aversion to certain foods; the majority of the pregnant women included in this study reported such symptoms. It should be noted that the 10.10 kg change in the weight variable referred to in the 50th percentile, from week 7 until week 37, is a value below the lower limit of the recommended weight increase range for a well-nourished pregnant woman until the 40th gestational week, ranging from 11.4 kg to 16.0 kg (16). The result could be conditioned being that weight increase calculations were performed until gestational week 37 due to the fact that the minimum number of measurements required in a percentile distribution was not available from that week on. However, when the weekly weight increase in each trimester of gestation for well-nourished pregnant women according to IOM was calculated, the total increment shown from week 7 until week 37 by the pregnant women in this study was within the suggested range (16). In reference to the BMI indicator for gestational age throughout pregnancy, a similar behavior to that of the weight was observed, which could be explained by the fact that the construction of the BMI indicator is based on the weight value. Comparisons of these results to other published results show that the values corresponding to the 3rd and 97th percentiles are within the ranges recommended by the Institute of Medicine (IOM) (18.5-25.0 kg/m2) to define a normal pre-pregnancy BMI. Likewise, the values of the 10th percentile for each gestational age are in agreement with the BMI values which define the “underweight zone”, according to Atalah´s table (8). However, the values of the 97th percentile are lower than those used by the same author to define the overweight zone. The latter could be explained by the way such table was prepared, as Atalah and collaborators used the cutoff points recommended by the FAO/WHO for the nutritional classification of nonpregnant adult women and estimated the “ideal” weekly weight increase for wellnourished pregnant women. In addition, they considered that the weight increase was higher in undernourished pregnant women and lower in overweight and obese pregnant women (8). With respect to the MAC, it should be noted that the small increase of 0.45 cm referred to in the 50th percentile throughout pregnancy agrees with that observed by other authors, who point out that this variable shows few changes throughout gestation. It is important to note that higher values close to 23 cm (with a maximum difference of 1 cm) correspond to the 3rd percentile in all of the studied gestational weeks. The WHO suggests a value below 23 cm to identify the population at risk of IUGR (3). Other authors consider the MAC of < 22 cm a risk factor for alterations in the product of the conception (17). Contrarily to that stated above, the values of percentiles 3 and 10 in this study are very close. On the other hand, the overall increase of 3.55 cm in the 50th percentile for the TC has been described by other researchers (3). The small increase of the CC from one gestational week to another, with a total increase of 1.6 cm observed in the 50th percentile, agrees with the findings of other researchers, confirming the fact that this circumference is considered to be an indicator of nutritional status at any stage of pregnancy as is the case of the MAC, considering the extremely small changes it undergoes throughout this period (3,4). The sample is adequate as it includes only healthy and well-nourished women; it is provided with the data required for this type of study; and the used methodology is well described and ensures its reproducibility. Errors regarding the instruments and measurement techniques have been controlled by calibrating the measuring instruments and by regularly standardizing the anthropometrists who performed the measurements. The above discussion allows us to conclude upon the importance of using percentile distributions of the anthropometric variables most commonly used for assessing nutritional status in pregnant women as it allows for a more effective classification of the nutritional status and provides for a better and timely interpretation of their variations. The percentile distributions of the weight, BMI, MAC, TC, and CC variables for each gestational week fill the information gap in the country in relation to nutritional anthropometric assessment tools in pregnant women. The results of this study provide the means to simplify the screening and follow-up of the nutritional status in an accurate manner at any stage of gestation until the 37th week. Because the values of the 10th percentile for each gestational age are very close to those of the 3rd percentile, we suggest using the 10th percentile to define the population at nutritional risk when using these reference values. The availability of weekly data for each variable and the compliance with the established quality standards to obtain these values leads to the assumption that their application in the nutritional assessment of pregnant women will ultimately contribute to a more accurate and adequate assessment. It is necessary to develop studies, which will allow for the validation of the effectiveness (Sensitivity – Specificity) of these reference values for the classification of the nutritional status of a pregnant woman at any stage of gestation between weeks 8 and 37. We would like to extend our special thanks and appreciation to Jorge de Abreu, a member of the Investigation Coordination of CANIA, for his kind support in reading and making suggestions on this manuscript. This paper was sponsored by Empresas POLAR. American Dietetic Association. Position of the American Dietetic Association: Nutrition and lifestyle for a healthy pregnancy outcome. J Am Dietet Assoc 2008;108:553-61. Onis M, Habicht J. Anthropometric reference data for international use: Recommendations from a World Health Organization expert committee. Am J Clin Nutr 1996;64(4):650-58.
WHO. Pregnant and lactating women. In: Physical status: the use and interpretation of anthropometry. WHO: Geneva; 1995. p.37-120. Krasovec K., Anderson M. Nutrición materna y productos del embarazo. Organización Panamericana de la Salud: Washington,D.C. Serie Publicación científica; 1992. p.529. Catalano PM. Management of obesity in pregnancy. Obstetr Gynecol 2007;109:419-33. Guelinckx I, Devlieger R, Beckers K, Vansant G. Maternal obesity: pregnancy complications gestational weight gain and nutrition. Obes Rev 2008;9:140-50. World Health Organization. Maternal anthropometry for prediction of pregnancy outcomes: Memorandum from a USAID/WHO/PAHO/Mother care meeting. Bull World Health Organ 1991;69(5):523-32. Atalah E, Castillo C, Castro R, Aldea A. Propuesta de un nuevo estándar de evaluación nutricional en embarazadas. Rev Med Chile 1997; 125:1429-436. Rached I, Azuaje A, Henriquez G. Estado nutricional en gestantes de una comunidad menos privilegiada de Caracas. An Venez Nutr 2002;15(2):94-104. Neumann CG. Referente data. In: Jelliffe DB, Jelliffe EF, editors. Human Nutrition. Nutrition and growth. New York: Plenum Press; 1979. p. 299-327. Tanner JM, Hiernaux J, Jarman S. Growth and physique studies. In: Weiner JS, Lourie JA, editors. Human biology: A guide to field methods. Oxford: Blackwell Scientific. 1969. p. 1-76. Hernández-Sampieri R, Fernández-Collado C, Baptista-Lucio P. Análisis de los datos. En: Metodología de la investigación. 3 ed. México: McGraw-Hill; 2004. p. 377-79. IBM Corp. SPSS 19.0. Manual del usuario. New York: IBM Corp: Armonk; 2010. Rasmussen KM, Yaktine AL, editors. Weight gain during pregnancy: Re-examining the guidelines. Nutrition during pregnancy. Washington, D.C.: National Academy Press; 2009. Kruger HS, Pharm M. Maternal anthropometry and pregnancy outcomes: a proposal for the monitoring of pregnancy weight gain in outpatient clinics in South Africa. Curationes 2005;28(4):40-9.